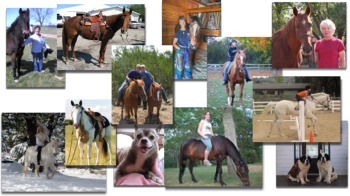 Read Paco's Success StoryInjuries to bones, tendons, and ligaments compounded by age and/or weight set the stage for the development of osteoarthritis. The joints, where bone ends articulate or connect, are the sites of arthritic conditions. Osteoarthritis is characterized by degeneration of the cartilage and bone of joints. It is often initiated by an injury to the bones and joints (hard tissues) or to tendons, ligaments, and cartilage (soft tissues) and begins with joint inflammation. As osteoarthritis progresses the joint surface (articular cartilage) becomes worn and thins causing joint distortion and pain, swelling and stiffness. Also known as degenerative joint disease, osteoarthritis frequently occurs in the weight bearing joints with aging. The symptoms will be most evident in cold, damp weather. 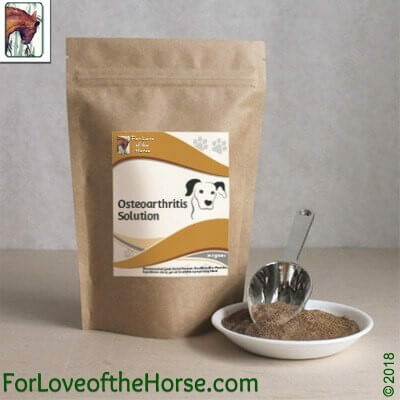 Osteoarthritis Solution immediately begins the suppression of the inflammatory processes and continues this reduction for the duration of use. This has the result of alleviating pain as well as sustaining the health of the involved cartilage through continual management of the inflammation. This herbal strategy works to stop bone degeneration and recover bone and joint integrity. 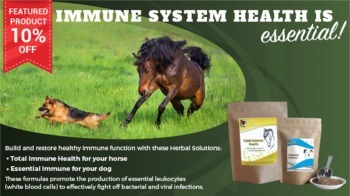 Horses and dogs using our Arthritis Solution are having extraordinary results. Read Our Success Stories. Ingredients: niu xi, gui sui bu within a proprietary blend. 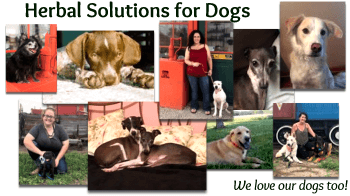 Osteoarthritis Solution for Dogs 345g Discounts Apply !